I noted in an earlier blog entry that the Sacramento Bee ran a nice obituary on retired UC Cooperative Extension food scientist George K. York II. "He was gentle and generous with his time, resources and really vast knowledge. Many times he had the opportunity to leave the university for industry and make 10 times the amount, but he was much happier sharing his knowledge with the people of California." Who says the media only report bad news? InsideBayArea.com published a heart-warming feature story today about a new honor for retired UC Cooperative Extension nutrition, family and consumer sciences advisor and San Mateo County director Gloria Brown. Brown received a "Local Hero" award Wednesday in recognition of four decades spent educating her community and raising awareness of serious health and nutrition issues, especially among African-Americans. Brown's list of accolades and accomplishments is long, according to the story. "She has served on so many boards, she can't keep track of them all," the article says. Two years ago, I had the pleasure of interviewing Brown for a news release about her retirement. At the time she told me the civil rights movement gave her the courage to apply for her job with UCCE in 1969, even though she was seven months pregnant. 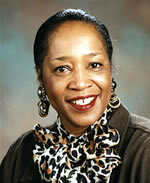 Brown lived in San Mateo County all her life, except for the years she spent in college at Texas Southern University. Brown graduated from high school at the height of the civil rights movement in the South and sought to be a first-hand witness of the momentous changes underway. The InsideBayArea story said that Brown pioneered screening services for breast cancer, diabetes and prostate cancer as a board member at Mills-Peninsula Health Services, is a recent inductee into the San Mateo County Women's Hall of Fame, and was named one of the 10 most influential Bay Area African-Americans in 2003. The Woodland Daily Democrat picked up a press release our office distributed a few days ago about funding UCCE nutrition educators received to create a low-literacy questionnaire to identify children on the path toward overweight or obesity. I delayed writing about this story's appearance in the news media a few days hoping that I would see it picked up elsewhere. In essence, the article announces the fact that the National Research Initiative funded a $390,000 grant that will allow UC Cooperative Extension experts to document the specific behaviors associated with the growth of overweight and obesity, such as whether parents eat vegetables in front of their children, whether the children play outside, and whether the children eat breakfast every day. "It's not enough for us to have a good idea what is going on," said principle investigator Marilyn Townsend, a nutrition specialist based at UC Davis. "We must prove it using a scientific process and that requires an accurate way to identify these behaviors." Of course, releases that report findings carry more weight than those about research being funded, but this story does raise questions that would be of interest to nutrition professionals and enthusiasts. One can say the release is "evergreen," so it may yet live another day. Any weather event seems to prompt the media to get reaction, and for the ag perspective, they frequently turn to the experts at UC Cooperative Extension. A story by David Sneed this past weekend in The (San Luis Obispo County) Tribune reported on rainfall at the Central Coast. It said recent storms have brought San Luis Obispo County’s rainfall totals to slightly above normal and asserted that farmers and ranchers would like still more. The weather station at Cal Poly, the article said, has records dating from 1869. It recorded slightly more than six inches of rain last year, while average precipitation at the Cal Poly station is 22 inches. Because of the disparity, UCCE farm advisor Royce Larsen and his NRCS colleague Karl Striby concluded that the average rainfall standard is not very useful, the story said. The Sacramento Bee ran a story advising residents to wait for rain-soaked planters to dry up before spring gardening. Reporter Pat Rubin spoke to UCCE advisor Chuck Ingels. "Soggy gardening? I try not to do it," Ingels was quoted. Over the weekend, the Sacramento Bee included a touching news obituary about retired UC Cooperative Extension food scientist George K. York II, who passed away last week at the age of 82. In his late teens, Dr. York planned a career in professional baseball, but he was drafted by the Marines and was wounded in the invasion of Iwo Jima. After the war, Dr. York began college studies at Stanford, eventually earning a Ph.D. at UC Davis in 1960. The story said Dr. York was a food bacteriologist with Cooperative Extension for more than 30 years, an authority on food-borne infections, and that he brought national attention to UC Davis as a major resource in food preservation. Dr. York was regarded as the father of the master food preserver program. The obituary said he was popular with kitchen cooks for his practical presentations on canning tomatoes, curing olives, cooking with raw eggs and other home food tasks. His son, George York III, said he loved getting out and talking to home canners, according to the article. "He connected with people so easily because he felt he was doing something really useful for society," his son is quoted.